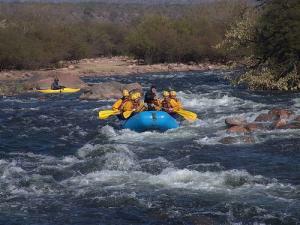 A rafting trip in Salta is a unique experience in that it not only provides the scenery and the nerve racking excitement; but also a trip through the Rio Juramento canyon where you can spot dinosaur tracks. Various sized rafts and kayaks are available to jump aboard before you head down the class II and III rapids for a day full of fun. This page rendered in 0.251 seconds.